We measured a selection of sizes in this pant and developed the chart below to help you choose a size. We show a range for the waist size to account for the Velcro adjustable waist. The top of the range is with the adjusters fully open, so they don’t get bigger. The measured inseam is listed below. In a sport/race pant like this, the pant is designed to only reach the top of the foot so the inseam measures out shorter than regular pants or jeans. If you subtract about 2” from your regular inseam in jeans, you can get an idea of what inseam you’d shoot for in a track pant like this. Most people will be tucking the pant inside boots so the exact inseam length won’t be critical, but you have to be in the ball park because the knee armor needs to line up with your knee, so you can’t be too tall or too short as compared to the inseam on the pant. 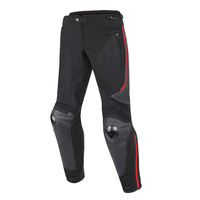 The Dainese MIG pants are made of a combination of textile, mesh and leather in critical areas. They come with armor in the knee/shin area. These will be great for sport riding on hot summer days. About 60% of this pant is a flow through mesh material which means air can flow right through these which will be welcome in summer. Other parts of the pants are either a Cordura stretch textile material or leather, both of which are more abrasion resistant materials and will perform better in case you fall. The waist of these pants is setup so they can be used as a “stand alone” pant, or preferably to be zipped to a Dainese jacket with the zipper that goes most of the way around the waist band. Of course the perfect mating jacket would be the MIG jacket (take the link below). The leg ends of the pants are highly tapered so you could wear them over riding shoes and boots that fit close to the ankle. If you have sport boots, they could be tucked inside. The only limiting factor would be the knee shin armor… its pretty robust and extends a long way down the shin, so if you plan to tuck in the pants, your boots need to have enough room for the lower end of the armor to fit inside. Speaking of the armor… it’s removable from the outside through the zipper just above the knee. For added impact protection, the knee pocket is padded and there is also the black metal external armor piece with the demon logo. The sides of the hips have an overlay of leather, but otherwise, no armor. As I mentioned, the pants are set up primarily for hot weather use, but you also get a removable windproof liner which you can install to block the wind somewhat. That means you can use the pants in somewhat cooler temps and still be comfortable. Dainese says: Riders seeking a riding pant offering a combination of protection, comfort and adaptability need look no further than the Mig, which boasts hybrid construction of washable Grid cowhide leather and Cordura® Comfort fabric, along with mesh fabric inserts and a removable windproof liner. Microelastic inserts ensure a good fit, and EN-certified protectors are included.